…Alexeyev was briefly detained last month after he picketed the city hall in St. Petersburg with a poster which said that "homosexuality is not a perversion." He said the judge has not presented the grounds for her decision, and that they will only be available next week. 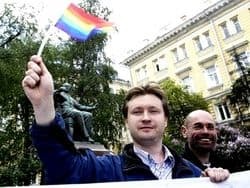 Calls to the court went unanswered shortly after the ruling…Alexeyev said he would go to Russia's Constitutional Court and then to the European Court of Human Rights in Strasbourg if a higher court in St. Petersburg upholds Friday's ruling.